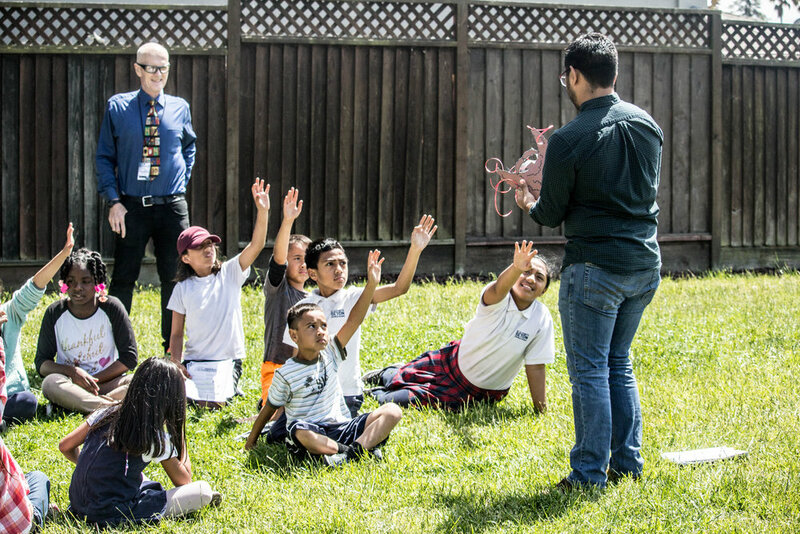 “Each spring we vacate our entire high school and send teams of students around the world to do service projects”, says Justin, who teaches Math and is a TKA water Polo and swimming coach at King’s Academy in Sunnyvale. ”The projects range anywhere from building homes in Tecate, Mexico, to post-hurricane clean up in Louisiana, to medical missions in Malawi, Africa, to supporting missionary training to indigenous people groups in the Amazon jungle in Ecuador,” he continued. This year there will be a new focus for service trips. “The ministry that has always been on my heart has been local suburban/urban missions, to the people right here at home” Justin recounts, and when the new principal at King’s asked the Spiritual Life Department to consider missions trips closer to home, Justin jumped at the chance. This spring, BCM students are exploring ways in which to express their own identity through visual art. 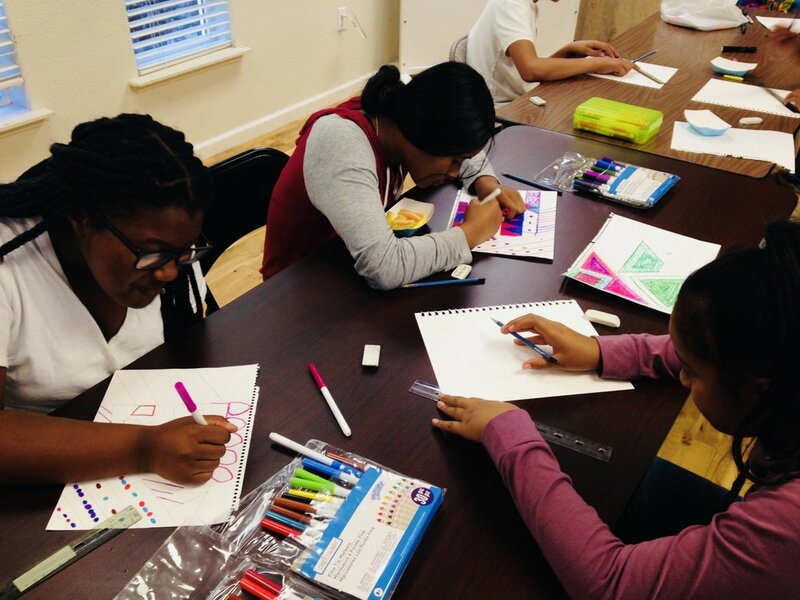 BCM’s art program entitled Create Art will be following EPACENTER’s Drawing 101: Six Elements of Art curriculum, which starts off with the basics such as drawing lines and shapes and ends with instruction in 3D and cartoon drawing. This class does not have a rigid structure and students are encouraged to be free and “outside the box” with the art they create. The curriculum allows BCM students to create art as a form of self-expression which frees them of any tight restrictions. Create Art students are currently working on collages and how to tie the many small elements of a collage together to make one unique work of art that communicates a part of their own identity. For the past 2 years, EPACENTER and BCM have maintained a partnership to bring BCM students Create Art, which begins in spring and lasts until summer. The mission of EPACENTER is to help facilitate youth in the discovery of their own talents and capabilities through art. Create Art is run by Troy Davis, EPACENTER’s Music and Visual Arts Instructor. Troy studied painting, digital software, figure drawing and color theory at the Academy of Art University, where he graduated with a BA in Illustration. As a long-time resident of East Palo Alto, Troy not only finds it easier to relate to BCM students but has a deeper understanding of the ever changing culture of East Palo Alto. We at BCM look forward to a long a fruitful relationship with Troy and EPACENTER. Students take a moment to smile for a picture as they work on their projects. Using bright colors and varying shapes work on sketches to add to their collages. A student uses an ipad to assist in creating sketches. It was the spring break of her senior year at Hope College and instead of planning a trip with her friends, Jordan decided to apply to Hope’s spring immersion trips, where students volunteer across the country in different communities. On the application, Jordan did not list BCM as her first choice. To be quite frank, Jordan was not completely sold on going on a mission trip in the first place, so when she got her acceptance email she was somewhat surprised and started to question if she wanted to follow through with the trip. After some thought, Jordan decided not to let this opportunity pass her by, and boy was she happy she didn’t. Through Hope’s partnership with BCM, Jordan was able to tutor students in KidSmart and participate in a family event with Bible Club. She also visited East Palo Alto high schools and learned about the history and demographics of East Palo Alto, which she said helped her better understand BCM students. Impressed by her natural connection with the students, Jordan was approached by multiple BCM staff members who encouraged her to apply for BCM’s year-long college graduate fellowship which would start after graduation. Jordan was flattered that multiple people felt she had the qualifications and temperament to be successful in student mentorship, but at the time, she did not give it too much thought. On her first day back at Hope College, Jordan ran into one of the Chaplains, whom she was very close to, and when he asked her about her experience at BCM, she recalled the amazing time she had mentoring and learning alongside the students. Jordan also mentioned being encouraged to apply for BCM’s Fellowship as she casually asked her Chaplain for a reference, to which he agreed. The next day she received an email from her Chaplain stating that he had already sent the reference to BCM. Because Hope and BCM have been partners for just about 15 years, Jordan’s Chaplain was not shy about getting in contact with BCM staff; Jordan on the other hand was rather caught off guard. She did not expect him to be so prompt in churning out her recommendation letter, especially because she had not made her mind up about whether she would even apply. Now she had no choice! After applying and going through the interview process, Jordan was excited to be offered the Fellowship position, but soon enough apprehension set in. Jordan lived in Chicago and went to college in Michigan; BCM is in California. Jordan received her degree in Dance and Business; mentoring students at BCM did not seem like it would put her specific education to use. After a week of mental gymnastics, Jordan decided to commit to BCM and become a Fellow, and she has never regretted that decision for a moment. Now, Jordan is completing her second year as a Fellow with BCM and looking back on her journey she said “It is clear that God led me to BCM.” As her time as a Fellow comes to a close and Jordan considers transitioning to a BCM staff member, she plans on allowing the Lord to lead her footsteps. 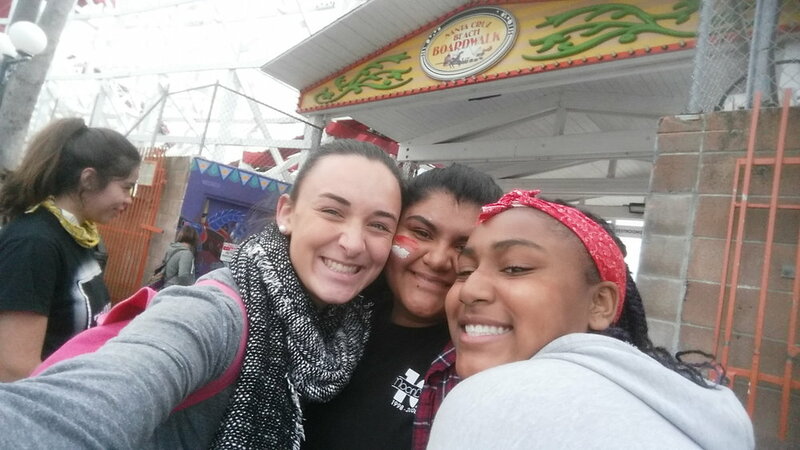 Jordan and her students snap a picture at Santa Cruz Beach Boardwalk. Jordan playing an intense game of Jenga with one of her students. Jordan and her students take goofy pictures during the middle school graduation celebration. On the hunt for a volunteer position that interested her, Lorena decided to seek help from Job Train and was delighted when they directed her to BCM. BCM offers several volunteer opportunities but Lorena found that devoting her time to KidSmart students was the perfect fit for her. As a volunteer, Lorena serves as a classroom aide who works one-on-one with her students. She assists students with their homework, reading comprehension, and math skills. During recess, she goes outside with her students and plays right alongside them. In my interview with Lorena, she spoke about how she not only sees herself as a tutor but also a mentor. “It will be more difficult for them to learn if they don’t know who you are” said Lorena as she discussed the importance of building relationships with her students and getting to know their individual learning habits. Lorena’s dedication to her community shines not only through her volunteer work but also in her career goals. She is currently attending college full time in the hopes of earning her degree in social work and becoming a probation officer. The main goal of the KidSmart program is to ensure that students’ academic skills are in line with their grade level while also preparing the students for the next school year. Recently, KidSmart Manager Diana Liggs noticed that it was becoming increasingly difficult to find KidSmart interns, so when Lorena came on board Diana was thrilled. After seeing Lorena’s love and dedication to her students, Diana decided to offer Lorena a paid position as a KidSmart intern, which Lorena happily accepted and will be starting once her hours through Job Train are complete. BCM is blessed to have so many wonderful, patient and dedicated volunteers like Lorena who go above and beyond to ensure our students receive not only quality academic help but also emotional, mental and spiritual support. Lorena poses with her students for a picture. 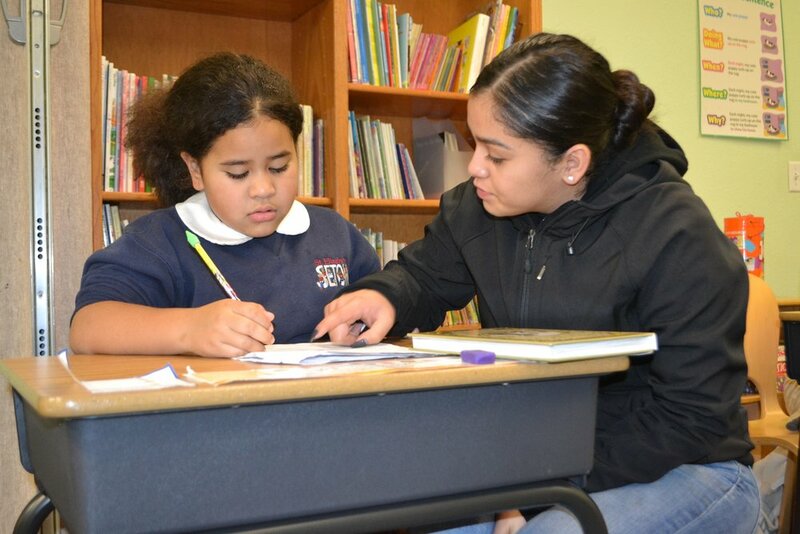 Lorena assists a student with her homework. Lorena and her students play jump rope during recess. James* had already been through some tough experiences in his short life time. Because of a legal status issue, his father was deported, leaving his mother as the sole provider for him and his siblings. James was always pretty active, but when it came to participating in praise and worship he seemed inclined to shy away and would find his way to the back of the class to limit his participation. As time went on and James behavior persisted, Bible Club leaders never forced him to participate but instead, continued to pray for him and to share the Lord’s message with him and the rest of their students. One day, something changed. Instead of hanging in the back during praise and worship, Bible Club leaders were delightfully surprised to see James energetically join in, singing and praising with the other students. Maybe it was the song that inspired him or maybe it was Jesus who touched his heart. Each child absorbs and begins to understand the beauty of God’s love, kindness and mercy at his or her own rate, which is why our Bible Club instructors are sure to be attentive to each student’s individual pace in an effort to meet them where they are at. Rushing anyone’s spiritual journey, even a child’s, can be ineffectual so instead Bible Club leaders allow their student’s love, praise and curiosity for the word of God to manifest organically. Being able to support and facilitate a child’s walk with God is a gift that BCM is honored to receive. Students raise their hands, ready to answer a question posed during the weekly lesson. With determination on their minds, kindness in their hearts and 10 days to make it happen, the students were able to collect enough hygiene products to fill 25 blessing bags! Robot Spartans win the Judges Award! Asked why she likes robotics, she shared that “It was fun to build things” and that she “liked building things”. 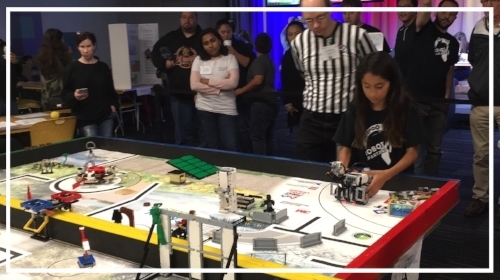 She had accidentally received a gift of Legos four years ago (and now has quite a few sets of Lego sets) and had gotten into the robotics part because of her love for Legos. “Missions are jobs that your robots have to do and complete on their own. They are programmed to do certain things on their own. Sometimes the Robot’s mission is to carry something, or to push certain buttons, to drop something off or to drive a set course called ‘line tracking’.” Austin paused, “the hardest tournament was definitely the 3rd one when our main mission didn’t work out.” What won them the Judges Award, Austin reported, was that their unsupervised team work to accomplish in the last mission clinched them high scores. We are SO proud of the students’ achievements. At the same time we would like to shout out to our EIGHTEEN amazing volunteers who make the Robotics team happen. The preparation of the teams and performance in the FLL competitions would not be possible without their hard work. During a StreetWorkz night in the spring, we challenged our kids to pray big. God wanted to bless them. We had them write down their prayers, seal it in an envelope and place it in a pile on the stage. As we circled up to pray over this collection of prayers, a student who had been sitting quietly, not writing, suddenly motioned for me to return to her table. "Remember that thing I told you about my family on Friday? Can I pray about that?" "Absolutely," I responded, "that's huge." "What do you want most?" "Well, I don't want my grandma to be upset or have the family so divided. Can I ask for that?" "Definitely, you can ask that God would love your family and help them heal as they forgive each other." "Yea, I think I want to forgive too." I stared at her. I couldn't fathom that kind of forgiveness she was describing. Later, as we split up for drop-offs, she walked up to me, gave me a hug and thanked me for helping her pray and letting her have more time to write. She planned to take her envelope home to pray some more. She said she was glad she told me about what had happened. I'm surprised by how far ahead our kids will plan. And how casually these seemingly demanding questions are thrown about. They're testing the waters. Just as often as the questions though, come the "threats." "If you're not at my high school graduation, I'll haunt you in your sleep." "If you don't take us there for our 8th grade outing too...boi." "It's been two weeks, you better visit me for lunch!" My first reactions were something like, "Excuse me?!" Then it clicks. They've come to expect these things. I've set a precedent for being in their schools, at their celebrations, and part of their weekends. They want me around and they trust that I care enough to want to be there. They soak up the attention and affection, dubbing me "Street Mom," or "Street Auntie." Driving back from an afternoon outing last Friday, I asked about their days. Rose-bud-thorn: something you really enjoyed, something you're looking forward to and something that wasn't so great about the day. One sixth grader responded, "My rose was getting to hang with my squad today." "Oh yea? Who's your squad?" I fully expected names of girls at school. Instead, she motioned to the other four students in the car. I was taken aback. Those five kids are my pilot group for a new middle school academic program. It hadn't occurred to me that this program could become their main community. We were only two weeks in. They had already come to enjoy each other's company, be friends and look forward to time spent together in tutoring, art workshops or just talking. God had been bonding them together even when I thought they hated it. He created a stable, safe, loving environment, allowing His grace to cover the rockiness of my struggle to form a burgeoning program. To our extended BCM family, I ask you to join us in prayer as we launch new and recurring fall programs. We need prayer for the Spirit to work through us (sometimes despite us), to love the kids, to guide them, to speak encouragement and truth to them in those vulnerable moments, to admit that we don’t know how to lift them up to dry land but together we’ll grasp the lifeline of hope to the solid ground that our Father provides. It all started 3 years ago as a far-off dream to take EPA students to Missouri. There’s this amazing urban sports camp there called Kids Across America (KAA) that I knew would change their lives. It’s a place where kids come from across the States for a week to learn about Jesus in a way that is relevant and fun. It’s also special to me because it changed me. This camp turned my faith upside down (in a good way). I was on staff for the summers of 2009 through 2015, working as a counselor my first few summers to the Women’s Director last year. Each season has had an incredible impact on my life full of joy, love and growth and that is what I wanted my students to experience. I eventually found myself working full-time at BCM starting the Fall of 2015. Throughout that school year, I made it a goal to not forget about the “dream.” Then early on in the year I got word that I’d be presenting my summer journey proposal to our executive staff. Once that was approved and I got permission from parents, it was go time! The local financial support was unbelievable and in about a week all the money needed for the trip had been raised. It was an amazing display of God’s incredible grace. Our students were getting more and more excited as our date to leave was quickly approaching. Permission forms were signed, plane tickets were bought, a rental car was reserved and camp fees were paid. Honestly, it seemed surreal that this was all really coming together. The date kept approaching and I would have days where I was legitimately nervous. As their chaperone, I had four students’ parents trusting me to get their children to Missouri and back safely! The travel day started with picking up our students at 2:30 a.m. from their homes before heading to the airport in time for our 5:00 a.m. flight. Before we knew it, we were entering the camp gates and our students were having the time of their lives! Our students performed dances, they fellowshipped with students from other parts of the country, they made commitments regarding their faith, and overall were truly blessed by that week. Sometimes I would look at them having fun and joy would overwhelm me. They were experiencing the things that made me fall in love with those camp grounds throughout my college career. It was a transformative, life-changing week for them and it was exactly what I had prayed for. I remember when we got back in town and I dropped all the kids off at their houses. I just smiled and took a deep breath. “Thank you, Jesus!” were the only words going through my mind. I felt peace, relief and most of all, joy. June 2016. It's been a year since I graduated. A year since I was busy celebrating with friends, finishing academic projects, packing up memories and looking to the next chapter. There weren't too many question marks in my immediate future. I'd go home to Texas for the summer, return to the Bay in August to begin my first "real" job and move into my first apartment with a good friend. I knew which church I'd attend and which Safeway I liked best. Foothill Expressway was my go-to route for driving just to think, and I knew a handful of places I could find a swing set should I wish to be particularly stress free. My first responsibility on the new job: plan a game day for the kick-off of StreetWorkz. Ooh-kay. I chose a series of minute-to-win-it activities and created a relay for two teams to compete. Every station was properly stocked with supplies, each student would only have to do one activity and I'd walk them through the seven stations before beginning. Middle school kids love competition and silly activities. How hard could it be? (Famous last words. You saw where this was going a mile ago.) I was hoarse before the first 15 minutes of that hour and a half. I was stuck in a stupor with an expression of utter denial on my tensed and worn features. I didn't get it. How did they not get it? I knew it wasn't impossible. I'd seen it done before. College did not prepare me for the peculiarity of children's moods, attitudes and thinking. That was nine months ago. I've signed on for year two. Serve BCM Students this Summer! Providing lunch by cooking or buying food for 40-50 students and summer staff. Serving lunch at 11:30 a.m.-1 p.m.
Mentoring students in our afternoon STEAM electives from 1 p.m. to 4 p.m. Joining the Prep & Support team. Serving in the Lunch team. Contact Holly at holly[at]bayshore[dot]org or (650) 327-9941 to serve! Here at Bayshore Christian Ministries, we recently concluded the year's StreetWorkz program for our middle school students. While my stint as an EPA Fellow still has the summer portion left, I feel uniquely refreshed by my time spent with StreetWorkz. My time working with the junior high students also has me feeling very full—like I just came from a big, warm party feast. This feeling of refreshment and contentment comes not from having grown and learned (although, I've learned so much I don't know where I would begin) nor does it come from anything I can take credit for; it comes from having witnessed the undeniable response and initiative God has claimed in the lives of 6, 7 and 8th graders. God does not seem super interested in doing things my way. God's got His own style of taking care of business. I was not initially excited about working with junior highers but Jesus snuck into my heart one night while I was sleeping and turned those feelings upside down. Two months after starting this job and right before Christmas, I broke my ankle. While I don't think Jesus personally went out of His way to crack my tibia, I did get to see how He used it later to start conversations about real life issues beyond the surface level adult-child plateau. Interwoven among lessons and talks on relationships, romantic love, racism, and heaven I got to see God personally grab handful of moments with His children (they are first and foremost His after all) and encounter them in life-changing ways. I saw Him take one kid at the start of the year and over several months enlarge the young man's inner capacity for peace, confidence and prayer. I saw another young lady take ownership of her friend group and exercise leadership and self-aware maturity. Following that there are the testimonies of God moving in unusual and supernatural way. You know, the kind of stories that last a lifetime? When God undeniably meets you in a dream, or speaks to you for the first time, or you witness a healing—that stuff stays with you—and God moved among our youth in a way that has staying power. Right now I find myself satisfied (re: my soul feels fat like in Psalm 63:5) and energized (re: refreshed), not because I did anything noteworthy, but because I have witnessed God's creative faithfulness. The students of StreetWorkz are caught up in a hundred different cycles, systems and problems outside of their control, outside of my control and outside the control of just about every single person in their life. I cannot change their situations or even really meaningfully do anything for them—truly only God can be their source of help. God is for them more than the rest of humanity combined. In Psalm 18:19 the Psalmist writes, “He brought me out into a spacious place; he rescued me because he delighted in me.” By the end of this year, I've witnessed a merciful Father swoop down and sweep up His daughters and sons into that open, “spacious place”. A group photo of the Retreat attendees. Smile everyone! At Bayshore Christian Ministries we love our Board! We want to introduce and welcome the newest board member, Kathy Welsh. The staff retreat took place January 15th-17th at Redwood Christian Park, also known as the Ark Park. It was a rainy weekend in the beautiful redwood forest. I am a new board member, still getting to know most of the staff, and I arrived in the dark on Friday night after a long drive on wet, windy roads. I found the rest of the group in the dining room enjoying the first delicious meal of the weekend, where there was time for relaxed conversations and getting more acquainted. The focus of the retreat was on prayer. We learned about Petition: Asking God directly for something for myself, and about Intercession: Prayer for another person, place or situation. We prayed over the city of East Palo Alto, including leadership in business and government. The speaker came with his wife and son, a talented seventeen year old who led worship with vocals and guitar while our own Stefie played the drum. On Saturday afternoon, Amy led us all in a hilarious game of celebrity charades! The entire group of BCM staff and interns, along with a couple of board members, volunteers, staff alumni, spouses and children numbered to a total of twenty. I was struck by how well we represented many demographics and came together effortlessly in our love for and dedication to our Lord, Jesus. It was like a glimpse of Heaven. In said environment we finished on Sunday morning beginning with a worship service followed by a most fitting teaching on our Unity in Christ led by Pastor Marcus Givens. Impact Report 2015 and #GivingTuesday! Thank you! What else can we say? #GivingTuesday was a met with a great wave of support as donors gave $6,250 towards helping us provide our youth with after-school academic tutoring. And there’s more—that amount has been matched by the Sanders Dickinson Foundation for a total raised of $12,500! We thank the Lord for you and your partnership! This past month we also released our annual report, Impact Report 2015. Read it to discover stories of Bayshore Christian Ministries’ work over the course of the year. We are pleased to introduce our three newest staff members who we welcomed into the BCM family this Fall! Cassie Tundag has joined us as our Director of Ministries and we have two new EPA Fellows, Alyssa Lorenzo and Kristofer Smiley, who will be serving within our middle school programs. We hope you enjoy learning a little about each of them and we look forward to a new year of ministry together. Cassie is excited to join the staff of BCM as the new Director of Ministries. Cassie has spent 10 years in vocational ministry in various capacities, the most recent being an associate pastor at a church in Dublin, CA. She is also a licensed minister with the Assemblies of God. Cassie left her hometown in rural Southern Idaho to attend Northwest University in Kirkland, WA, and graduated with a BA in Psychology. She has had the opportunity to travel and serve people in various places and stages of life. She has worked with teenagers, college students, and adults of all ages. She has traveled to New Orleans, Mexico, Israel, El Salvador, Philippines and Hollywood on mission trips. Cassie is engaged to be married in December to a wonderful man who is a middle school music teacher. She looks forward to serving the community of East Palo Alto and our families. Alyssa is originally from Austin, Texas, but going on 5 years now, the Bay Area has become a new home. In June 2015, Alyssa graduated with a Bachelors in Medical Anthropology from Stanford University, which fuels her interest in and heart for relational work and holistic healing. She first heard about BCM through a Christian fellowship on campus and was encouraged by BCM's community oriented vision and Christ-centered work. Alyssa loves working and growing as part of the genuine and joyful BCM family and is looking forward to what's to come. Alyssa is serving as an EPA Fellow in our middle school programs. Kris was born in California and raised in the Middle East. Having accrued a significant amount of personal experience in healthcare and missional settings he completed high school in Sunnyvale in 2006, and a BA in politics from Willamette University in Salem, Oregon, in 2010. Post-graduation, Kris first volunteered at BCM through through an internship with his church, Highway Community. His experiences and time spent at BCM as well as a number of other non-profit ministries in East Palo Alto led him to begin his seminary degree at Fuller Theological Seminary (which continues to this day!). His heart for BCM is intimately rooted in a passionate, near obsessive, curiosity for what the Lord is doing among the youth in the Bay Area. Kris loves to read, drink tea, pray, sing and make good company laugh. BCM will provide three distinct summer programs for community youth this year. Read on to find out about KidSmart Bridge, CREATE Academy and Summer Bible Club Outreach. KidSmart Summer Bridge is a three-week extension of KidSmart for a select group of 10-15 students to help them engage in academics and hone skills needed for the next grade level. This program is running June 8-25 this year. CREATE Academy will run from June 29 through July 24. 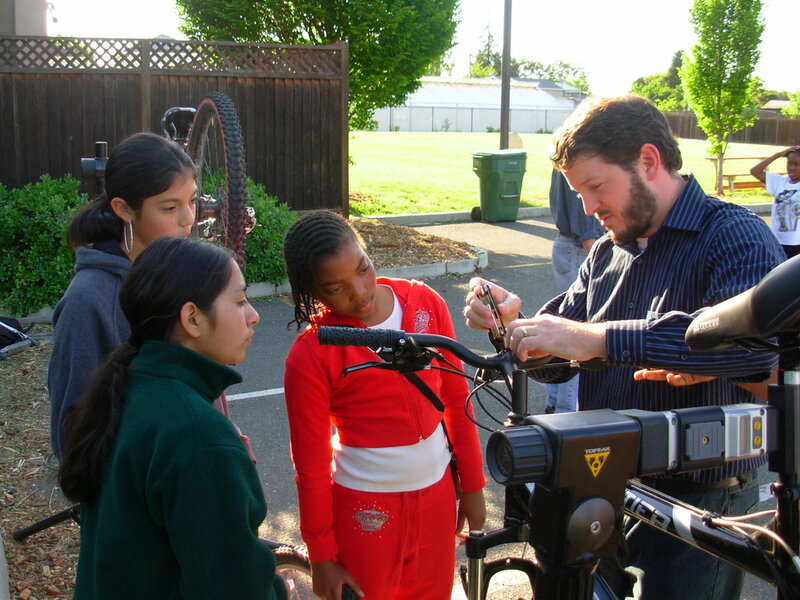 Each day 6th-8th graders will be exposed to mathematics, technology and art instruction in order to strengthen their critical thinking and mathematics skills as well as grow their confidence in preparation for future opportunities in STEAM (Science, Technology, Engineering, Art and Mathematics) programs and careers. Morning mathematics courses will give way to hands-on afternoon art, robotics and game-design workshops. Book-ending this program, partner organization RYAA will provide morning and afternoon character-building and sports sessions. We serve the students a nutritious lunch every day. If you would like to contribute snacks or lunch, or help serve it to the students, email Holly Meyer at holly@bayshore.org. Check the lunch schedule here to see what dates are still available. Summer Bible Club Outreach (SBCO) is a vacation bible school-like program held throughout the local community for six weeks. We hire local interns to bring the Gospel to students throughout the community, under the supervision of Program Manager, Tammy. During SBCO children learn Bible lessons, eat healthy lunches, sing songs, and play sports. Ultimately, students learn what it means to follow Christ. -Come for a visit and see the programs for yourself! -Make a lunch, sponsor a lunch, or donate snacks like fruit or crackers. -Assist in a math classroom 10 am-12 pm or a tech or art classroom 1-4 pm daily or weekly. -Demonstrate a cool technology gadget or science experiment for our students during lunch one day. -Sponsor a child to attend CREATE Academy. Email holly@bayshore.org to lend a hand.